I need to work on both of these items because the rooms I've worked on for the clients I've had this year are SO fun - I want to move into every house I've had the pleasure of designing for! In the spirit of beginning a new series on the MidModMich blog, I'll share with you my own work for our own nursery. Yes, that's correct: we are adding to our family in January and are going with a "neutral" color scheme since we didn't find out the gender. Not that aqua and orange are considered neutral by any means, but to me, neither scream GIRL or BOY. Greg, my husband, was crossing his fingers I wouldn't ask him to paint our former guest room. When we moved in, the third bedroom in our house was a our office/guest room and I went with Benjamin Moore's Ozark Shadows - a color I've used in many, many projects because it's a medium gray which actually reads gray. It's also the main color of the house and I love it so. You can see what this small room looked like before we gave the bed away to a friend, and moved my small desk to the basement HERE. We are keeping the Ozark Shadows gray walls, adding a cozy gray shag rug to our gray-stained maple floors, and adding in a bit of aqua, orange and white to lighten it up a bit in there. There is only one window in this room, so it's the darkest room in the house and we need some light, but not too much - I'm crossing my fingers for a sleepy babe. A chair & ottoman I've been holding onto since college will be reupholstered in some dark gray Herman Miller fabric, and I picked up a vintage pole light that needs some TLC about a year ago. While the crib above is what I'd pick if I were buying a new one, we will be using the same crib we used with our son five years ago, which is white. It's a little more modern than midcentury, but we already own it and I still like it, so I'm running with it. Greg did pick up a vintage Broyhill Brasilia set including the long dresser in the plan above. This will double as a changing table for now, and stay in the room as a dresser as our son/daughter grows, because we have the double bed frame for later. Accessories will be kept to a minimum and added as collected. I did pick up the aqua table lamp a couple of weeks ago at IKEA when I was there for the rug. And I have a couple of cute orange items in my inventory that I'd like to see in there as well. 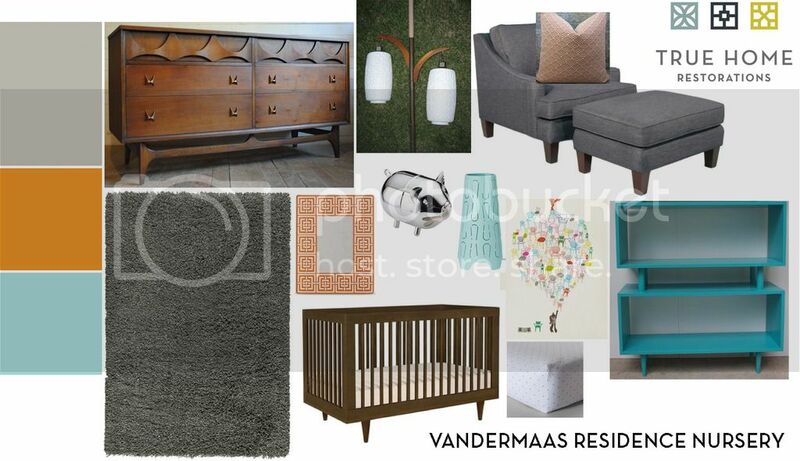 Not too much real estate for decor items, but certainly a few spots to personalize the room. We still have about ten weeks to go until this little one joins us, and I still have a lot of organizing to do before we put the furniture in there. I'll keep you posted and hope to share photos before the addition arrives!